Gather your friends and throw a vegan ice cream sundae party this Sunday! Make it extra special by making your own vegan ice cream—without a fancy shmancy ice cream maker. Of course you could use that fancy shamancy ice cream maker, but it’s much more fun to gather your friends and sandwich-sized re-sealable bags. Once you’ve all made your ice cream, pour magic chocolate sauce on top to see it instantly solidify, plop a scoop of coconut whipped cream on top and a sprinkle of nuts, and enjoy. You can even slice a banana in half, lengthwise, and turn this sundae into a banana split. Blend ice cream ingredients in a blender until smooth and then pour evenly between into 4 sandwich sized sealable bags. Seal tightly, trying to remove as much air as possible. In the 4 gallon sized bags, evenly distribute ice and rock salt. Place one sandwich sized bag into each gallon sized bag and seal tightly. 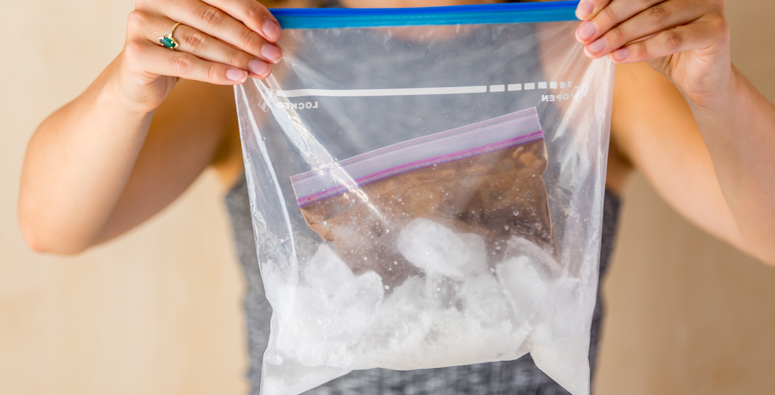 Squeeze bags for 10 to 15 minutes or until ice cream is thickened. Remove only coconut cream (the thick white substance at the top of the can). Using a mixer, whip cream until soft peaks form. Add in vanilla extract and sweetener. Place ice cream in bowls, top with chocolate sauce, whipped cream and desired toppings.